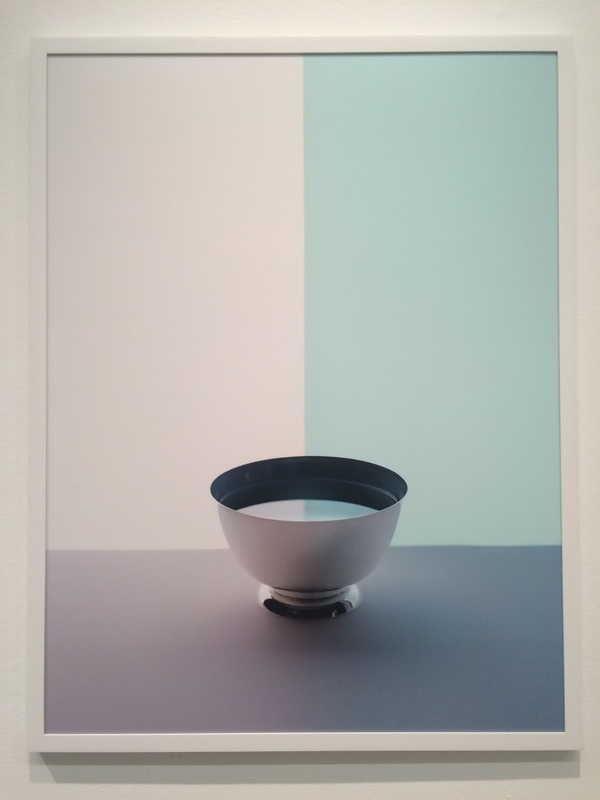 Half Bowl, from the Available Light series, 2012. Sarah Charlesworth's (1947—2013) work gained prominence in the late 70s and early 80s as part of the awkwardly named "pictures generation," when it fit into the prevailing zeitgeist with its sleek, polished feel and deeper questions about the nature of perception and imagery. It feels greatly in opposition to many trends in the air today, for example the work of Albert Oehlen; both artists' work is on view the New Museum. Sarah Charlesworth: Doubleworld is broken into several groupings, each one as breathtaking as the previous—the "0 + 1" white on white series, in which the most subtle shadows and shadings reveal the subjects; "Stills," a riveting, disturbing series of falling figures taken from news photographs; "Objects of Desire," icons that either refer to desirability, or which are themselves desirable things, on brilliantly hued backgrounds or in diptychs; and "Available Light," a group of aqua-hued images which play with reflection and perception. One of that series, Half Bowl, shows a handsome silver bowl with water, in which the rear wall's reflection is mirrored. Everything looks so perfect—the palette, the object, the diffuse light—and yet the imagery on the water's surface is not real. Through Sep 20. Albert Oehlen: Home and Garden features a number of large canvases by the German artist (born 1954) showing his muddy palette and layered imagery of genres that can vary from geometric, pixellated, figurative, consumerist, and pop culture. The largest ones, from the early 2000s, are the opposite of beautiful, and often feel deliberately messy. More recent works show Oehlen breathing more space into his canvases, and using a more pleasing palette and generally lighter wispy touch, while continuing to mix in numbers and letters into his queries about the nature of painting. Through Sep 15. 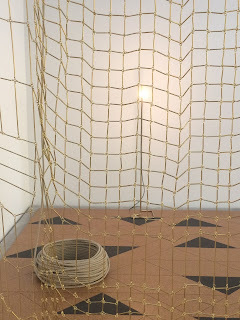 The ground floor gallery at the New Museum, located behind the coffee bar, sometimes feels like an afterthought, but sculptor Leonor Antunes' installation, I Stand Like a Mirror Before You, is one of the more intriguing shows I've seen in that space. This Portuguese artist has lined the floor with geometric cork panels, giving an immediate soft feel to your step. 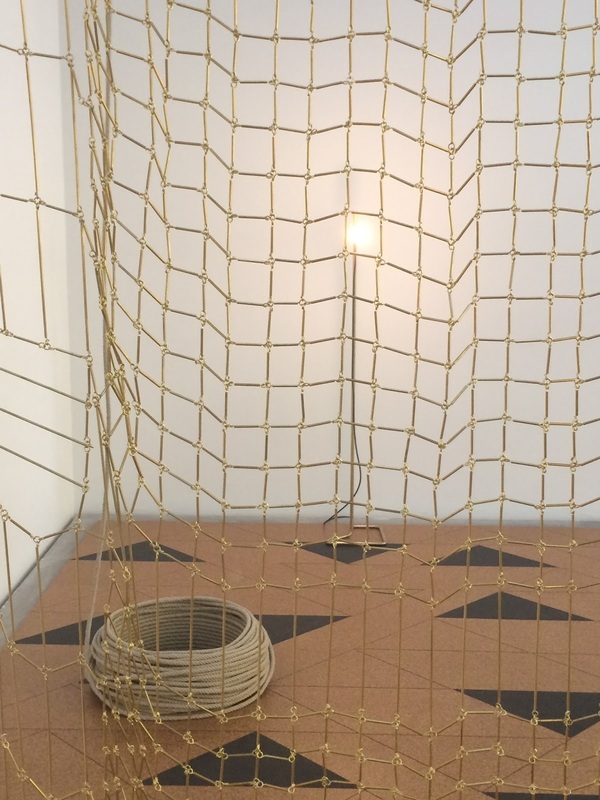 She has created mesh curtain-like panels from gold metal links, black rubber, and leather roping. Freestanding panels are formed from wavy plexiglas. The entire installation feels burnished, textured, and strangest of all, functional. Through Sep 6. 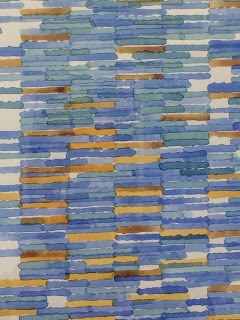 Detail of a watercolor by Andrew Forge. In this show of 10 paintings and 10 works on paper, Forge's (British, 1923—2002) graceful palette and eye for detail work with his vocabulary of dots and lines to form absorbing abstractions. 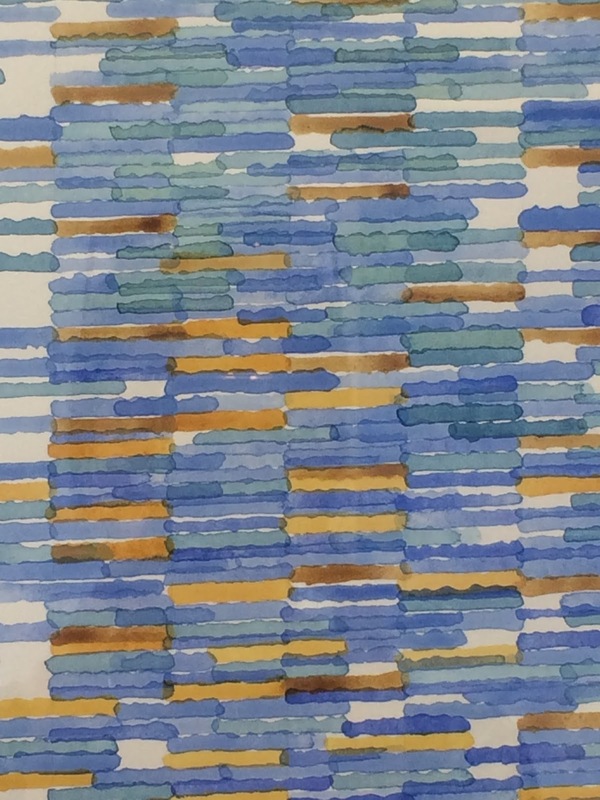 15 Rivington, through Aug 4. Peet's assemblages are small in size but have great impact. Rough-hewn ceramics, found objects, photographic, and other elements are mixed in satisfying formations, with dollops of color and pattern adding thrilling flair. 1 Rivington, through July 31.